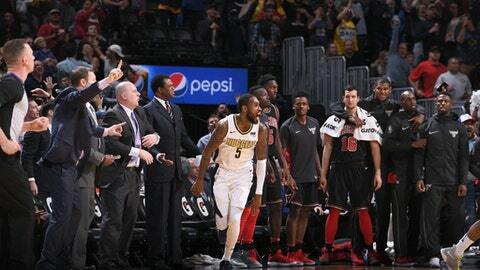 DENVER (AP) Will Barton provided the early spark, then delivered in the final moments to help the Denver Nuggets escape with a narrow victory. Bulls: F Nikola Mirotic has increased his practice load and is close to returning. ”He’s really in training camp mode,” Hoiberg said. ”He’s had a lot of individual work but nothing simulates that playing up and down, 5-on-5 type action. Mirotic has been out since a preseason altercation with teammate Bobby Portis left him with several broken bones in his face as well as a concussion. … Zach LaVine (left ACL tear) will have a full practice Friday after going through individual drills Thursday. Nuggets: Chandler was out for the second straight game with low back soreness. Juancho Hernangomez again got the start in his place. … Richard Jefferson played a season-high 12 minutes. When Jokic tried to walk to the locker room after getting hurt, Jefferson ran over and stopped him. The 16-year veteran told the 22-year-old center he needed to take his foul shots before leaving. Bulls: Host Sacramento on Friday night. Nuggets: Host the Los Angeles Lakers on Saturday night in Lonzo Ball’s first game at Pepsi Center.